Apple has officially announced its sixth generation the iPhone 5, and it is made from a combination of glass and aluminum, it is 18 percent thinner than the iPhone 4S and measures 7.6mm. The iPhone 5 features a 4 inch Retina Display with a resolution of 1136 x 640 pixels, which means that you can now have a 5th row of icons on your iPhone’s home screen. The iPhone 5 will also come with LTE, HSPA+ and DC-HSDPA, and it will be available with AT&T, Sprint and Verizon in the US, and a number of carriers in Europe. WiFi has also had an update on the iPhone 5, it now features 802.11m 2.4GHz and 5GHz WiFi up to 150 Mbps, plus the iPhone 5 features a new faster A6 Apple processor. The new A6 processor in the iPhone 5 is two times faster in terms of processing power and graphics than the iPhone 4S processor, and it also features a new battery which means up to 8 hours over LTE. The iPhone 5 features an 8 megapixel backside illuminated camera with an f/2/4 aperture and a 5 element lens, the camera has be re-designed from the version that was released in the iPhone 4S. One of the new features on the iPhone 5s camera is a panorama mode which will let you take panoramic photos on your iPhone 5, it can also record HD video in 1080p and comes with improved video stability and face detection, plus you can also take photos whilst recording video. The front facing camera on the iPhone 5 is now 720p capable, and Apple has also added some more microphones to the handset there are now a total of three microphones, one on the front, back and bottom of the handset. As the rumors suggested the iPhone 5 will feature a new Lightning connector which is 80 percent smaller than the previous connector, and Apple are also releasing an adapter as we previously mentioned so that it will work with older accessories. The iPhone 5 will go on sale on the 21st of September and it will go up for pre-order on Friday the 14th of September, exactly like our source told us last week. 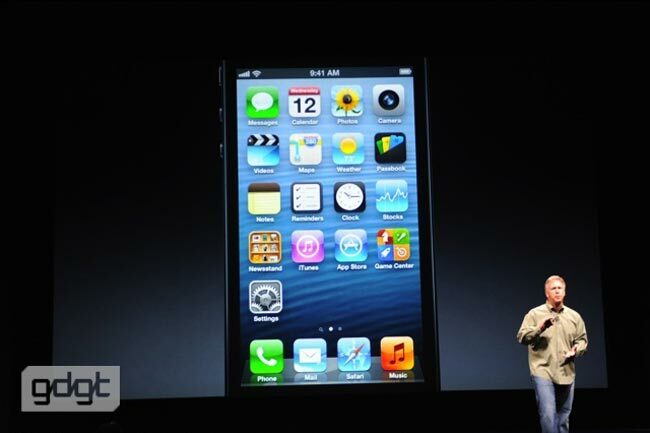 The iPhone 5 Will be available in white and black as the same price as the iPhone 4S, the 16GB model will be available for $199, 32GB for $299 and the 64GB for $399, these prices are based on a new two year contract.